Last edited by mjp94cbr100f; 08-23-2016 at 12:44 PM. I have not used this kind, but years ago. I have used basically the same thing, always looked white after I sprayed it on. I thought it did well for protecting against rust, and I hated cleaning it off the wheel and every where else it flung to. I don't think it protects against wear. Any different then anything else. Just protect better against rust. I have been using Maxima Chain Wax for a long time. There is little fling. Put the bike up on the center stand, put the running bike in 1st gear, using a piece of cardboard to place between the chain and wheel, spray the chain on the inside. Wait about 1/2 hour for it to set-up. I keep a big can in the garage and carry the small can in the tank bag for rides over 1,000 miles. It stays on in rain due to the wax. I wax the day after riding in the rain and about every 600 miles. 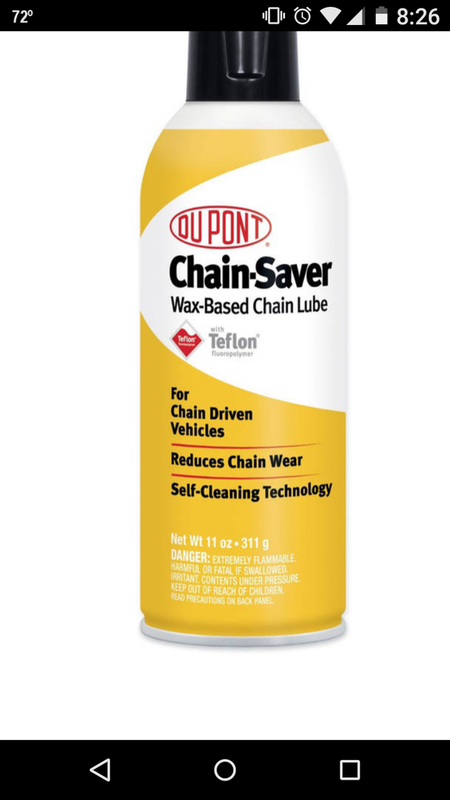 I haven't used Dupont wax chain lube w teflon. One more bit of advice to all readers, if the rollers on the chain are shiny, you need lube. before a ride I look at my chain. If the rollers are not gray or darker I need to wax up. Last edited by mjp94cbr100f; 08-23-2016 at 12:49 PM. I personally prefer to lube after the ride as the chain is nice and warm and it works in better. Also, less fling. Chain lube or chain wax?